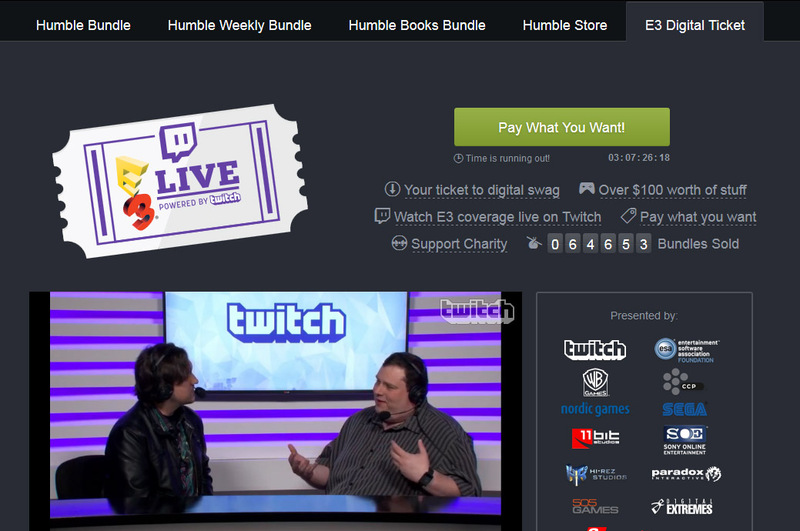 Humble Bundle and Twitch have teamed up to offer everyone an E3 bundle to help promote Twitch's Livestream coverage of E3. It's like being at E3, but without the hassle. Are you tuning in to the Official E3 2014 Livestream on Twitch and feeling salty about being a bit empty-handed? Fear not, because we're delivering the swag right to you. Pay whatever you want and receive an EVE Online Starter Pack and Rifter Krusual Skin, Orc and Crossbreed masks for PAYDAY 2, a SMITE Almighty Zeus bundle including the Almighty Zeus skin and Zeus, DLC for Company of Heroes 2, the Nomadic Tribes Culture Pack for Total War: ROME II, a Warframe Booster Pack, a 1-week closed beta key for Landmark and the E3 Robe in Magicka: Wizard Wars. You also get the full versions of MX vs ATV Reflex, Anomaly 2 plus soundtrack and Sid Meier's Civilization III: Complete, along with a 1-month subscription to Twitch Turbo for an ad-free Twitch experience. Beat the average price and add on the Mortal Kombat Arcade Kollection. All this swag will be available while supplies last so be sure to get it today! Some regional content restrictions may apply.